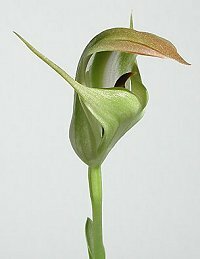 The Tuber Bank operates to give terrestrial orchid growers a means of passing on excess orchid tubers to other society members. It is also an opportunity for other orchid growers to add orchids to their collection they may not have access to otherwise. By distributing orchids to many growers, the Tuber Bank increases the chances of survival of orchid species. 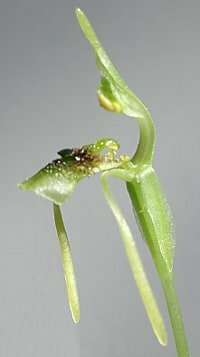 The Tuber Bank operates in January each year as this is the time when most terrestrial orchid species are dormant. In October, growers are requested to submit a list of orchids they expect to be donating to the Tuber Bank. 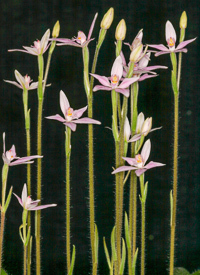 A list of available orchids is then compiled and printed in the December Bulletin. Members can submit their order from the list and the tubers will be posted out, or can be collected from the Tuber Bank Co-ordinator in mid January. Orchid tubers donated to the tuber bank should be positively identified (with provenance details if available), in good condition, clean, disease and virus free. It is the responsibility of the grower to be able to prove that that orchids donated have come from a legal source. For obvious reasons there are generally more "easy to grow" tubers available than "difficult to grow" ones. Where possible, the size of a serve of tubers will be a minimum of 4 tubers. However this may be less in the case of "difficult to grow" orchids. To help distribute the tubers equitably, members are limited to a maximum order of 50 serves. Only single serves of "difficult to grow" orchids will be supplied. For all other categories up to 2 serves of any single species can be ordered. There can be no guarantee that all tuber orders will be fulfilled as tuber numbers are limited and the system works on a supply and demand basis. Sorting and packing of tubers weekend. Members are invited to join the tuber bank team to donate tubers and assist with the distribution. To place an order with the Tuber Bank you must be a member of ANOS Vic . The Tuber Bank only operates within Australia. Unfortunately due to international and interstate quarantine regulations and requirements the Tuber Bank is not available to members in Tasmania, Western Australia or overseas. Tuber Bank Co-ordinator - Peter Wallace. If you have any questions about the Tuber Bank contact Peter.